Finding Dory was preceded by the short film Piper, which was a characteristically cute little story of a little sandpiper who at first is traumatised by water, but then learns to innovate by following some little hermit crabs and becomes the best little hunter around. 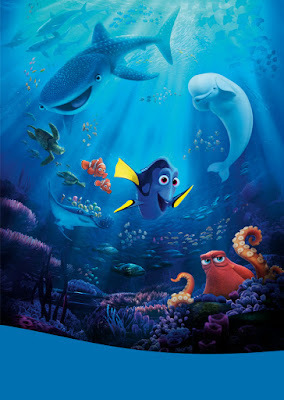 It’s a very Pixar story, extremely cute and full of heart (though of course requires us to be highly selective with what life forms we anthropomorphise), with plenty going for it technically – not just the water effects, but the clever way the simulated depth of field imitated cameras focusing on very small things. For me, though, the strangest surprise was seeing King Crimson stalwart (and recent NyX collaborator) Adrian Belew provided the music. The movie itself was a triumph. When the sequel to Finding Nemo was announced, people were sceptical. Finding Nemo again? But the shift of the story from Marlin to Dory was a very clever one. Dory as a character centred on the quirk of her memory loss. That made her a character who was extremely amusing but shallow – what would she forget next? Her friends? Her companions? Where did she come from? What was she doing before she met Marlin? So here we get a quest for self-discovery from a fish with short-term memory loss. And, indeed, long-term memory loss. Dory doesn’t remember her parents, until small things begin to remind her of where she grew up. Not in the ocean, but in captivity. Like the first film, Finding Dory is primarily a journey – or two journeys, since Marlin and Dory are separated through much of the story. On this journey, numerous characters are introduced very quickly – burly, protective but fun-loving sea-lions; insecure but loveable whales; a self-centred but good-hearted octopus; a typical small role for John Ratzenburger as a little crab quietly trimming the lawn. Sigourney Weaver steals the show without actually having a character, and there’s a very satisfying mini-cameo right at the end to tie up some loose threads from the first film. Of course, the film relies heavily on coincidence, highly unlikely feats of action and an octopus able to thrive seemingly indefinitely out of water. But those don’t impede a simple, direct and at times very moving plot. There’s a little plot device involving shells that is particularly sweet. Having this kind of ensemble cast works well in an animation, when characters can be so distinct without having to play a very large role in the story, and the humour is always gentle, affectionate and celebrates pushing yourself a little further before and thinking outside the box. Visually, this is also triumphant, a notable improvement from the first film, and the huge central tank of the aquarium is particularly beautiful – though of course animating something designed to be beautiful is going to result in beauty, so that helps the visual impact of the film. In some ways the ending is a little messy and one wonders if there wasn’t some huge impact on how humans view marine life, but it was also a satisfying large-scale moment in a relatively small-scale film. Sequels are often seen as a lazy cash-in, and very often detract from the original. But this kind of sequel, made 13 years later from a place of real affection for the original, filling a gap that persists from the original storyline, is exactly how a sequel should be done. And it didn’t hurt that baby Dory was just so damn cute!